How much television do you watch? If you are living in my house, the answer would be too much. That said, I like knowing that I have the choice to watch as much or as little as I would like, when I please. I have had Cablevision for many years. Not too many complaints and their customer service is pretty good, but there were some issues with Cablevision which I didn't like. When you change the channel, there is a delay before the new channel you selected shows up. And, unless you have a DVR in more than one room, you can only watch what you had recorded in the room with the DVR. There are additional differences between the two, including all these widgets offered with Fios TV, but the two I mentioned were what bothered me most about Cablevision. Enter Fios TV from www.verizon.com. One DVR is needed and you can then watch whatever you recorded in any other room which has an HD box and your TV. If you have the Ultimate package with Fios TV from www.verizon.com, which is similar to the Gold package with Cablevision, you will find that you receive some channels not available with Cablevision or which would cost even more to get. For me, having these additional channels makes having Fios TV much better. 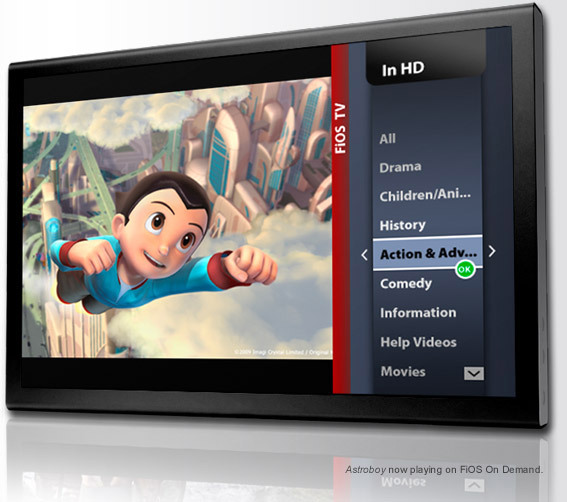 In fact, there seems to be many more choices with Verizon's Fios TV. I understand that some people will not like the contract which lasts for 2 years when you subscribe to Fios TV. There is a pro-rated cancellation fee of $360, and no contract or fee with Cablevision. I already had my internet and phone service with Verizon Fios so now I have all three which also saves some money. In the past I had internet service with Cablevision, but had problems with it. For those of you with Cablevision, especially if you aren't taking advantage of the Triple Play pricing, I suggest you take a look at Verizon Fios TV, Internet and Phone package. Now I just have to learn which numbers correspond to the stations! Sorry to see you leave and hope you will consider coming back and taking advantage of the many benefits that come with having all three Optimum services, including the Optimum Rewards program - free movies at Clearview Cinemas on Tuesdays and other discounts, free access to wireless Internet access across our service through our Optimum WiFi deployment (nation's largest and most advanced WiFi network) and other meaningful advantages over our phone company and satellite competitors. We offer more than 100 channels of free HD, innovative mosaic channels (iO Quick View) that make it easy to find Kids, News and Sports programming, local news 24/7 through News 12, MSG Varsity school and sports programming from your community, not to mention unlimited calling across the U.S., Canada and Puerto Rico, and more than a dozen popular calling features, free. Appreciate you posting on this and, as I said above, we would love to have you back and add you to the growing list of those who have tried other providers and returned to Cablevision/Optimum. American Airline's Miles Can Fly Away!